We have some gorgeous new Silk Matka fabrics in the store! Silk Matka, also known as "raw" silk, has a lovely, slightly coarse texture similar to linen, but much more refined. It's a perfect spring suiting, ideal for jackets, trousers, and structured dresses. The look of this classic fabric is crisp, clean, and smart. We may still be getting the occasional snowfall, but Spring is slowly starting to emerge. And Spring sewing means blouses! The ideal spring blouse is soft, great for layering, and feels great to wear. Look for bright and fresh fabrics to help shake off that winter feeling! To get you inspired, here are a few blouses we have displayed at Treadle right now. This first one in red shirting is from a Katherine Tilton pattern, Butterick 6325, and features asymmetric details and an interesting collar pleat. This Japanese cotton double gauze blouse (McCall's 6124) has a smooth, figure-skimming fit due to front and back princess seaming. Perfect for wearing under cardigans and jackets! Want something quick and simple? McCall's 7360 is a half-buttoning pullover with a boxy, relaxed fit. This lavender Swiss dot fabric makes it springy and sweet! This one shows a great use of printed cotton lawn. Not too many seams to break up the large print, and a longer cut that flows softly over the body. Made from McCall's 7327, it also has a lovely self-bias neck binding and asymmetric layers at the hem. Stop by and find your perfect spring blouse today! And if you need more garment inspiration, check the "projects" tag on our blog! We have some new additions from Robert Kaufman's London Calling line. These silky smooth cotton lawn prints are just in time for spring sewing! We have some fantastic new prints in linen and heavyweight cotton. This first linen in particular has been very popular, and has such a large print it took two photos to truly capture it! These two are all cotton, in a heavier weight that's perfect for bags, crafts, upholstery, and home sewing. Stop by and see all our great cotton prints! This new group from Moda is quietly alluring. The subtle, muted shades give an antique feel to prints featuring small florals, trees, and blocks of handwriting. You'll currently find these cotton prints in a section with our historic reproduction fabrics. 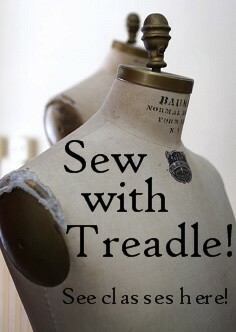 KIDS' SUMMER SEWING AT TREADLE! IT'S TIME TO SIGN UP FOR SUMMER CLASSES FOR KIDS! Attention budding designers, young fashionistas, creative kids: Explore what it takes to make your design idea turn into reality and then sew it! From pillowcases, stuffed animals, pj bottoms, skirts, tops and dresses, camps are designed to encourage creativity while learning a life-long skill. Small camp sizes allow for much individual attention. Half day camps and weekly afternoon sessions for beginners to advanced. Appropriate for ages 9 - 18. If you have any questions or would like to register for a class, please call us at 651-698-9690. Last week we looked at some linen prints from Cotton and Steel. Today we're sharing these softer fabrics made with apparel in mind. First up, some smooth, lightweight cotton lawn prints. Next, these drapey, silky rayon challis prints. Truly delightful for spring tops and dresses! We have some cute new cotton prints from designer Riley Blake. Take a look!